Take the Brennero Highway (A22) in direction South Tyrol and exit in Bressanone/Val Pusteria. Follow the road for approx. 10 km and exit on the left to Vandoies/Terento. Drive across the village of Vandoies (approx. 800 meters) and turn left to the Pustertaler Sonnenstraße in direction of Terento. From Vandoies it is approx. 6 km to Terento. Turn right into the village centre of Terento and continue straight beyond the village square to the Unterdorfstraße. 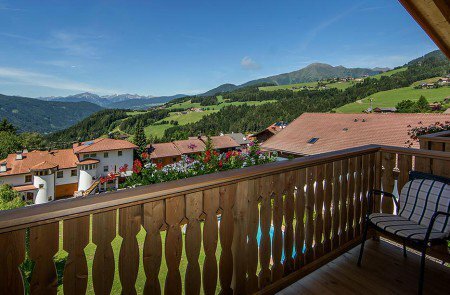 You will reach the Nature Hotel Edelweiss after 400 meters on the right side. exit at Brunico Ovest. Continue in direction Brunico. At the roundabout, take the third exit in direction Falzes. At the next roundabout take the second exit towards Falzes and drive past the villages of Falzes, Issing, Mühlen, Hofern to Terento. Turn left into the village centre of Terento and continue straight beyond the village square to the Unterdorfstraße. 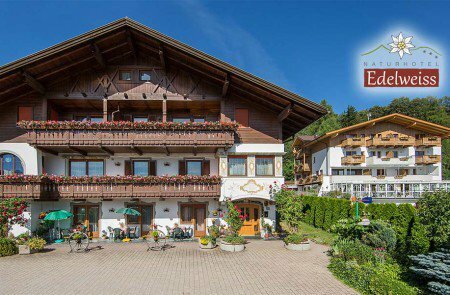 You will reach the Nature Hotel Edelweiss after 400 meters on the right side. Take the IC or EC to Fortezza. All trains coming from north or south stop here. Take a local train to Val Pusteria – to Vintl (Vandoies) or to Bruneck (Brunico). From Brunico there are good bus connections to Terento (except Sundays and holidays). Alternatively, you can also take a taxi from the train station in Brunico or Vandoies to Terento. Scheduled flights are offered to and from Bolzano (67 km), Innsbruck (94 km), Verona (210 km) or Treviso (211 km). For further information, please contact your travel agency.